Rich in proteins, vitamins and minerals, goat milk has been valued since ancient times as a moisturizing and healing skin treatment. It also contains natural alpha-hydroxy acids which will help soften and rejuvenate your skin. 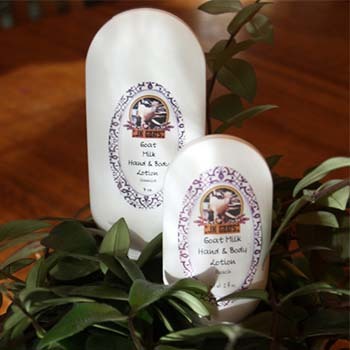 We add shea butter, almond oil, avocado oil and Vitamin E for a lotion that will leave your skin feeling soft and silky. Each fragrance is available in a 2 oz. or 4 oz. size.